Here in Portland, Maine we have a Portland Society of Architects, just like Boston has the BSA. Now of course we're not as big scale here, but it's a great organization from my experience. 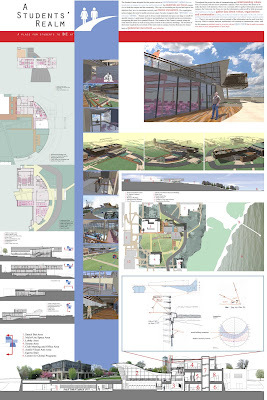 This Spring I entered my thesis from 2006 in the PSA's Unbuilt Architecture Awards Competition in the "Intern" category. . . and I won! I didn't make the award ceremony because I was volunteering for HOBY, but the board I submitted will be on display this coming Friday, June 5th at the Salt Institute for Documentary Studies which is now at 561 Congress Street. I am excited to have my thesis on display. It will be during the First Friday Art Walk so there are sure to be tons of people walking around. The Salt Institute is also a fantastic institution, so it will be great to be able to hang out there for an evening. It will hopefully be a warm summer evening full of art and conversation. I am looking forward rubbing elbows with friends, family and colleagues all night, and I will have something of my own to talk about for a change. I invite anyone interested to come! This is not my video, but a friend made it for her film class. It was fun to be part of, and the Empire Contra Dance really is awesome!